We love the holidays at our house, but boy does it mean that the activity level picks up and there are so many more things to do and get done. I was so excited to get the chance to test drive the 2017 Mitsubishi Outlander GT during the week of Thanksgiving. There were so many fun and exciting things to do and I needed a car that could keep up with our Thanksgiving week schedule. As soon as I got the 2017 Mitsubishi Outlander GT I took it out for a night on the town to see Mamma Mia! 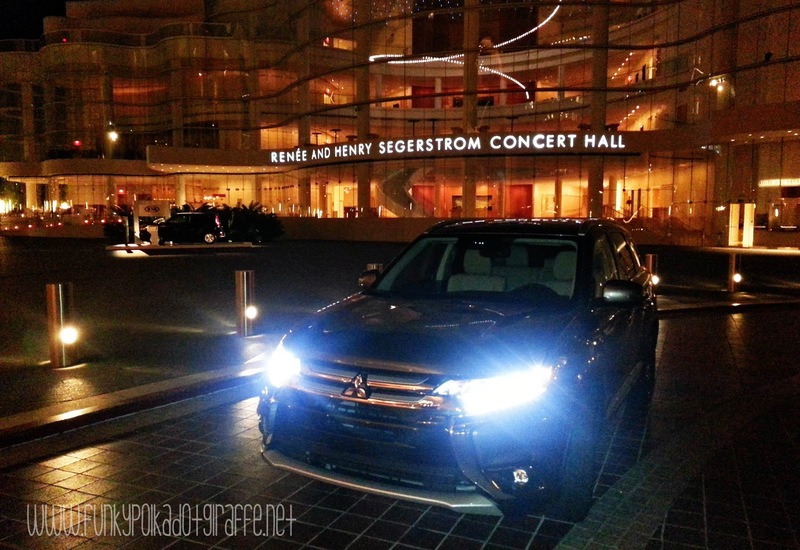 's farewell tour at the Segerstrom Center for the Fine Arts. I loved the multi-view camera system! The parking garage can be a tricky place to get in and out of, especially with a larger vehicle. But this advanced system uses multiple cameras around the vehicle to create a composite, bird's eye view of the Outlander. It also has a wide angle view so you can see what is directly behind you. It was so cool! I was like, "How is it doing that?!" I could see all around the vehicle. It is such a great feature I haven't seen in other vehicles. The next day it was time to do the Thanksgiving dinner shopping! 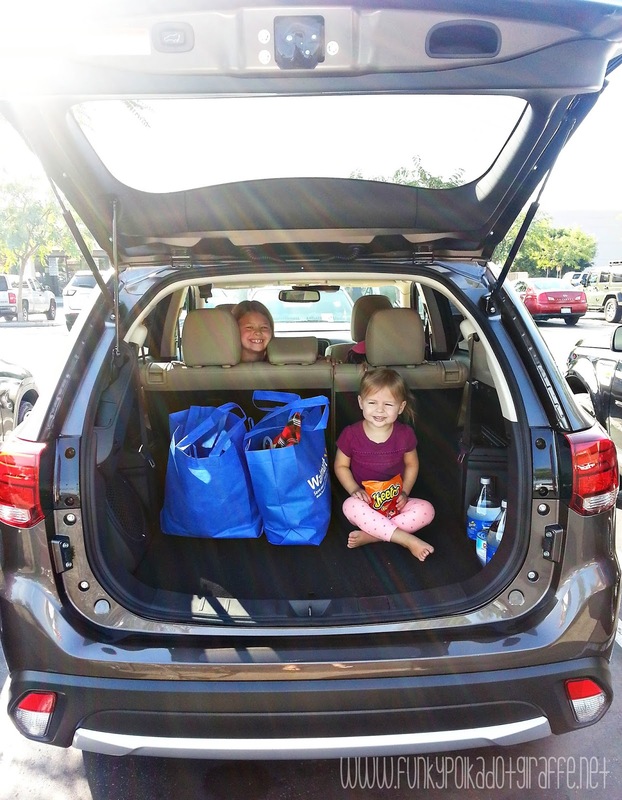 The cargo space was perfect for grabbing all the food we needed and I still had space in the 2nd row for the girls to sit. If JT had been with us and I need to put up the 3rd row of seats, it has a 50/50 split, so I could still put up one seat and leave the other side for our pies, milk, and rolls that we needed for Thanksgiving dinner. 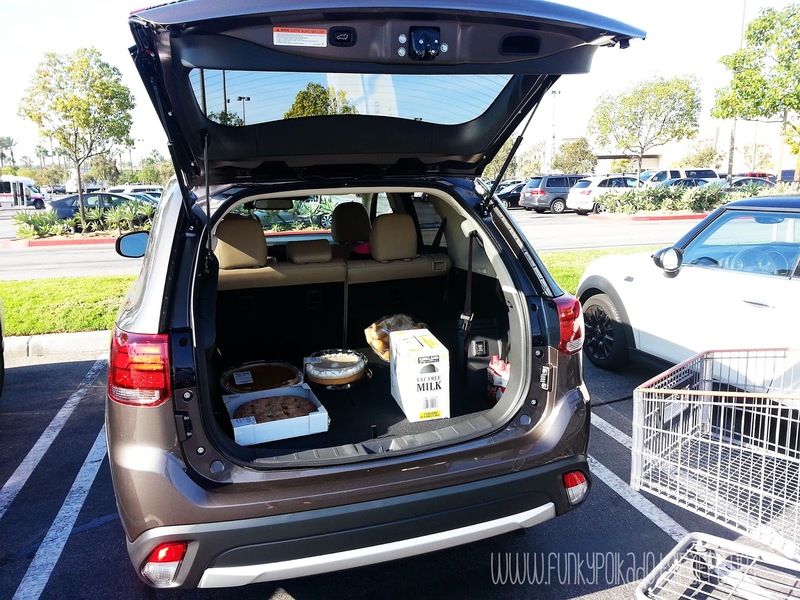 I was really impressed with the all the passenger space and cargo space the Outlander has to offer. 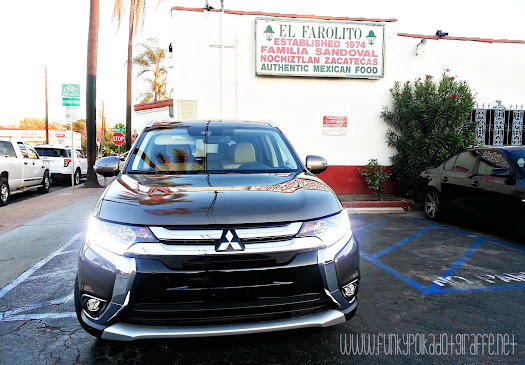 On Black Friday we decided to skip any cooking and took the 2017 Outlander to our favorite Mexican restaurant for dinner. Again, with the multi-view camera system it was a breeze to park in the tiny little parking lot behind the restaurant. We also used the Android Auto feature to navigate through construction. Since the app pairs with your phone, you can use Google Maps like you know and love on the home screen so you can keep your eyes up and on the road. I did miss the on-board navigation, but I also liked that I was used Google Maps, so it's a give and take with this feature. We did some Black Friday shopping and I was impressed with how easily the 2nd row folded down so we could put in some big items. Make sure you check out my video review below so you can see just how easily the 2nd row of seats stows when you need that extra cargo space. 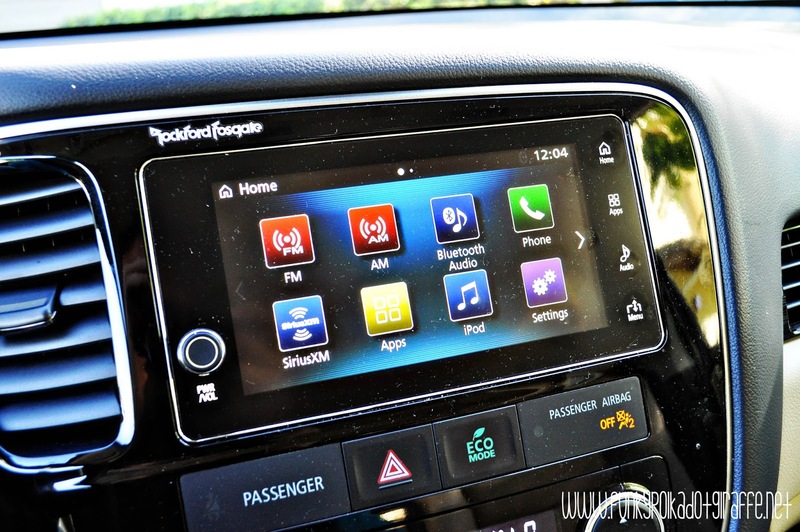 I also love Rockford Fosgate sound system. It has nine speakers, including a 10-inch dual-voice coil subwoofer with Punch Control that deliversdeep, rich bass and crystal-clear highs. It was my favorite to turn up the punch when the kids weren't in the car and enjoy some amazing bass! You know I'm all about that bass! 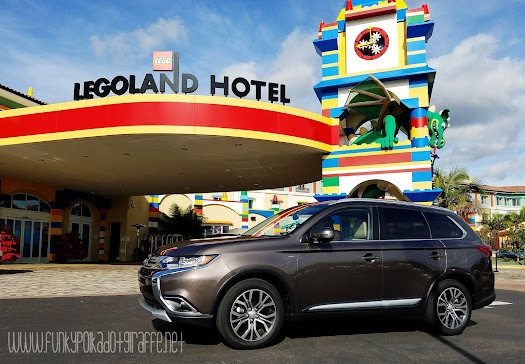 We took the 2017 Mitsubishi Outlander GT down to Carlsbad to attend the tree lighting at LEGOLAND and I loved all the safety features that kept us safe on our drive. The Adaptive Cruise Control uses radar technology to help you maintain a safe driving distance from the vehicle in front of you. The Forward Collision Mitigation uses both laser radar and camera technology to determine if a frontal collision with a vehicle or pedestrian is imminent. It warns you with both audible and visual signals and, if necessary, automatically applies moderate to emergency braking to reduce the severity of the collision, or if possible, prevent the collision. The Blind Spot Warning and Lane Change Assist alerted me when a vehicle is in my blind spot. That is so helpful when you are traveling on the freeway. And if you try to change lanes while someone is in your blind spot, then you get a three-beep warning to let you know to stay put until the car is gone. The Lane Departure Warning keeps you in your lane using an onboard camera and warns you audibly and visually if you are leaving your lane unintentionally. The home screen was bright and visually appealing and easy to navigate. I thought the interior was beautiful with the leather seating surfaces and the gloss black instrument panel. We enjoyed the heated front seats on chilly mornings and I loved the 8-way power adjustable driver's seat so I could get comfortable when driving. 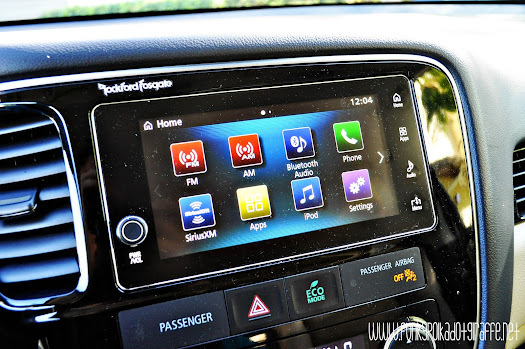 The hands-free Bluetooth technology kept us safe when I had to take a call when driving. And the power liftgate made it easy for the kids to get things out of the back when I dropped them off for school in the morning. We had a great time with the 2017 Mitsubishi Outlander GT and it is a good size vehicle for our family of five. Since it seats seven passengers, we had some wiggle room for either more cargo or a friend or two to join us on our adventures. 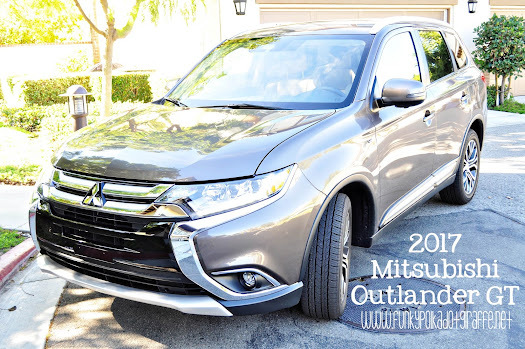 One thing I felt was lacking in the 2016 Outlander was the pick-up speed when you hit the gas, that seemed to be addressed in the 2017 Outlander with its 3.0L V6 engine and 224 horsepower. Check out my YouTube video for more interior shots of the 2017 Mitsubishi Outlander GT and to see how easy it is to stow the 2nd row of seats!